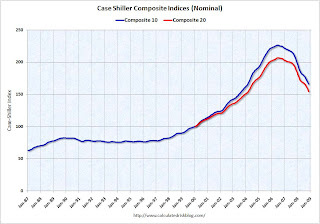 S&P/Case-Shiller released their monthly Home Price Indices for November this morning. This includes prices for 20 individual cities, and two composite indices (10 cities and 20 cities). Note: This is not the quarterly national house price index. The Composite 10 index is off 26.6% from the peak. The Composite 20 index is off 25.1% from the peak. Prices are still falling, and will probably continue to fall for some time. The Composite 10 is off 19.1% over the last year. The Composite 20 is off 18.2% over the last year. These are the worst year-over-year price declines for the Composite indices since the housing bubble burst. In Phoenix, house prices have declined more than 40% from the peak. 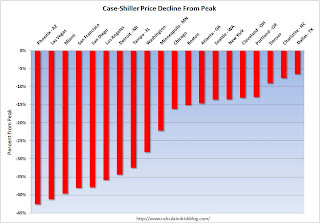 At the other end of the spectrum, prices in Charlotte and Dallas are only off about 6% to 8% from the peak. 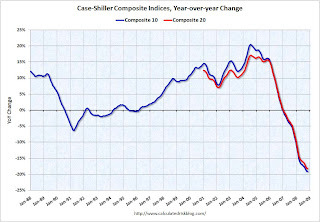 Prices fell at least 1% in all Case-Shiller cities in November.